Clipper ships were long, narrow, very fast sailing ships designed by Americans (1843-1869) for very long voyages, as to China. The were full-rigged ships that had upwards of an acre of canvas; the design made for limited cargo space. They set many speed records. The "Flying Cloud" in 1854 went from Boston to San Francisco in 89 days 8 hours. The "Sovereign of the Seas" once sailed 421 nautical miles (227 km) in a day—an average of 20.2 mph (32.5 km/h), or 17.5 knots, which is faster than the cruising speed of most cargo ships today. The American Civil War and the increasing use of composite iron and steel hulls led to a shift in clipper construction to Britain, where shipyards had been building smaller vessels of the clipper type for some time, but now began competing directly with the Americans. A golden age of the tea-clipper ensued with the races to bring the first of the seasons’ tea from China to the London tea-market, creating enormous public interest. In 1866, 5 clippers left Foo Chow in China at about the same time with the two leading ships – Ariel and Taeping - arriving in London on the same tide, 99 days later. The last of the 5 arrived less than 2 days after the leaders. The opening of the Suez Canal in 1869 spelt the end of the specialised tea-clipper. 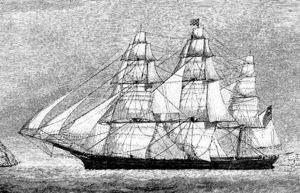 For a while they were used in the Australian wool trade and carrying South American nitrate - and as a large smuggling craft they were without peer - but the development of the large 4 and 5 masted barques with their enormous efficiency and a drop in the need for large cargoes to be transported very quickly led to a rapid end for this glorious craft. It is fortunate that one of the last of the breed was preserved as a museum. The Cutty Sark resides at Greenwich, London, as a reminder of the era. Whilst it is the large full-rigged ship that comes to mind, the term was first applied to the very fast schooners of the Baltimore type which became famous for their blockade-running exploits during the War of 1812, and infamous as slave ships after the British abolition in 1807. The introduction of square-rig to the beautifully efficient hull design of these vessels created the American clipper which is still considered to be the pinnacle of the age of the sailing ship. This page was last modified on 26 September 2018, at 09:50.